I resisted making this one, but finally caved when I started imagining how a spicy peanut butter sauce and a sweet berry sauce would taste on oven-roasted potatoes. It started sounding pretty good. The original is at Number 28 on 29 Ways to Honor the Glory of Peanut Butter and Jelly with an offering from Potato Champion Food Truck in Oregon. I’ve never had real Canadian-style Poutine, nor have I eaten at Potato Champion, but I wasn’t going to let that stop me. Preheat oven to 425-degrees F and line a baking sheet with parchment paper. Combine all ingredients in a large bowl and mix to coat the fries with the seasonings. Bake fries for 30-35 minutes, turning halfway through, until fries are tender and browned. 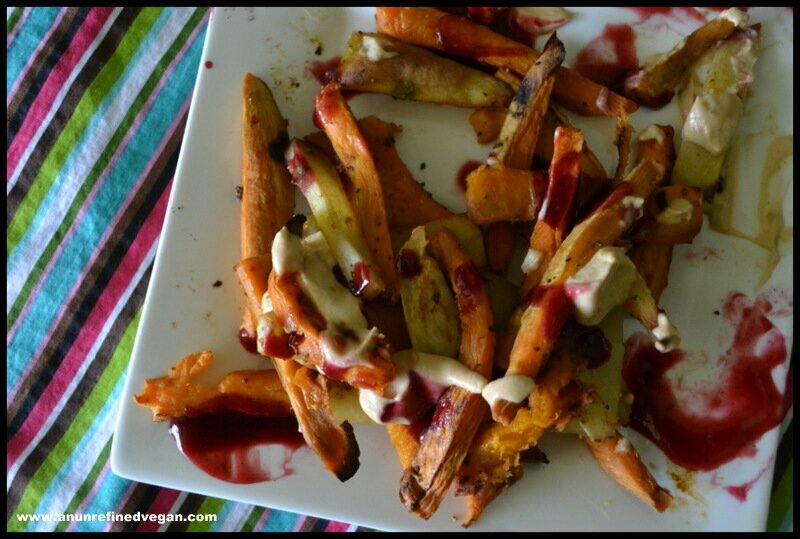 Place fries on a serving plate and drizzle liberally with peanut sauce and blackberry sauce. Serve with extra sauce on the side. In a small saucepan, combine jam through chile powder. Bring to a simmer and stir occasionally, breaking down the blackberries with a spoon. Let the mixture simmer for about 15 minutes, then carefully strain through a sieve and discard the solids. Return the sauce to the pan. Whisk together the water and arrowroot powder and pour into the sauce. Turn the heat to very low and stir constantly until the mixture begins to thicken. Do not let it boil. Remove from the heat and use immediately, or let cool before storing in the refrigerator. The sauce will thicken as it cools. This will make more than you’ll need for the 2 servings of fries. Combine all of the ingredients in a blender and process until very smooth. Use immediately or store in an air-tight container in the refrigerator. This recipes makes more than you’ll need for the 2 servings of fries. They look good! I particularly like the sound of that smoky spicy peanut sauce. Another combination that totally surprised me. It somehow all works. This is crazy! Looks amazing but I’m not sure I could get behind pb + j with potatoes.. The smoky pb sauce would be good on anything I’m sure. I thought the same – but it does work. You have to forget about jam being sweet or peanut butter being too, well, peanut buttery. Oooh that sounds great 🙂 I´m a big fan of peanut sauce. I am seriously drooling right now! I feel your hesitancy. I felt the same. But it just…works. These 2 special sauces are made in a very original savoury way, I love that! I would have never thought of using PEanuts,in a savoury way like that. MMMMMMMM! Hmmm. My first thought was “um, yuck” 🙂 But now I’m not so sure… I just may have to try it. Thanks for expanding our horizons! My first thought, too. And then I decided to just go ahead and try it. Surprised myself with how well all of the flavors meshed! Oh I think that peanut sauce should be made in quadruplicate so it can be put on everything. Ha! Now that you mention it, it sure does! How accidentally gory of me!! And yes, at first this sounds like an odd recipe, but the flavors are familiar. Ewww – talk about scary! Original poutine is actually pretty good although not in my vegan vocabulary. We made it Asian-style last week with kimchi and BBQ jackfruit, though. It was divine. Maybe I will try the PB & J theme next. 😛 Oh wow – with jackfruit?! Inspired!! Gotta try that. Wow, this is both incredibly inventive and delicious-looking. Pinning immediately. i heart roasted any kind of potatoes and this just takes it to a whole new awesome level! I can happily eat a big plate of roasted potatoes for dinner, nothing else. How can I resist eating this? The smoky peanut sauce is really interesting and it’s going to be the first recipe I make after MoFo. Only not sure if I can find out chipotle here. Thank you! I think I’d better send you some chipotle in adobo if you can’t find it – wonderful ingredient. I completely understand this recipe and really really want to try it!! We’ve been in love with poutine ever since we visited Canada last year and this is a great twist on the original! Yes, yes, yes!! I love poutine in all it’s gravy, cheese and fries glory. This version is brilliant, love it Ann! Well this is just about the MOST EPIC thing I have ever seen. Your genius never ceases to amaze me!